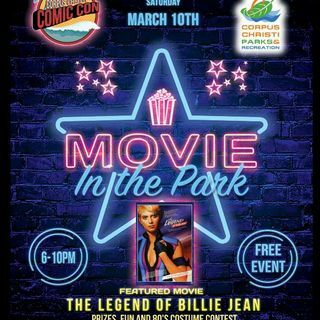 CORPUS CHRISTI, TX – The Corpus Christi Parks & Recreation Department and Corpus Christi Comic Con have partnered to host a free “Movie in the Park” at Cole Park Amphitheater. The cult classic “The Legend of Billie Jean” film will be screened on Saturday, March 10, 2018 from 6:00 p.m. to 10:00 p.m. This adventure movie was filmed in Corpus Christi with scenes shot at Sunrise Mall, the Harbor Bridge, Bob Hall Pier and several locations along S.P.I.D. So, it is no surprise that it has a special place in the hearts of many locals. The film was released on July 19, 1985. We invite everyone to come dressed as your favorite 80s character and compete in the costume contest. There will be prizes and tons of fun that you will not want to miss. The event is free and open for all ages. Children must be accompanied by adults to attend.